David Hockney’s latest exhibition, A Bigger Picture, is the culmination of a life-long obsession with perspective and the art of looking. Hockney has long argued against the “tyranny of a single point of perspective” which has dominated several centuries of Western landscape painting. In response he has sought to distort perspective, or with his photomontages has sought to keep our gaze moving, adopting the Chinese “moving perspective”, where the eye is constantly wandering, unable to settle on a single viewpoint. In this enormous and varied exhibition, Hockney has used a variety of techniques to loosen our reliance on traditional landscapes, challenging us to really engage with what we can see. One approach is to show us paintings so large they dominate whole walls, making it impossible to absorb in detail in their entirety. You can take-in the whole painting from the end of the room, but ultimately you must move in closely to gain any sense of the detail. When you do approach the painting this closely, it is impossible to take in all the panels of the painting as a whole. Another method is to take the same views and paint them over and over again. As the light changes significantly during the course of the day, this repetition demonstrates the variation in light and also the gradual change of the seasons. Trees burst into leaf, hedgerows burst into flower, and the scene is fundamentally altered. Each landscape can be viewed in isolation, but true meaning is derived by comparing them to their neighbour, with the transition of winter to spring. In one particularly effective technique, we watch a video installation of nine cameras strapped to Hockney’s car, showing nine video streams of the Woldgate Woods. As the car slowly edges forward, these nine perspectives scramble the brain, each camera “a separate act of seeing…”. Branches don’t quite line up between screens, and we are tilted off balance, unable to locate a single point of perspective in the installation as a whole. We are forced to engage with the Woldgate Woods in the way in which Hockney does himself. This re-discovered love affair with his childhood landscape began in 1997 when Hockney returned to Bradford to see his longstanding friend, Jonathan Silver, who was dying of cancer. Hockney found himself painting watercolour sketches to take to the hospital each day where Jonathan was missing the open spaces terribly. 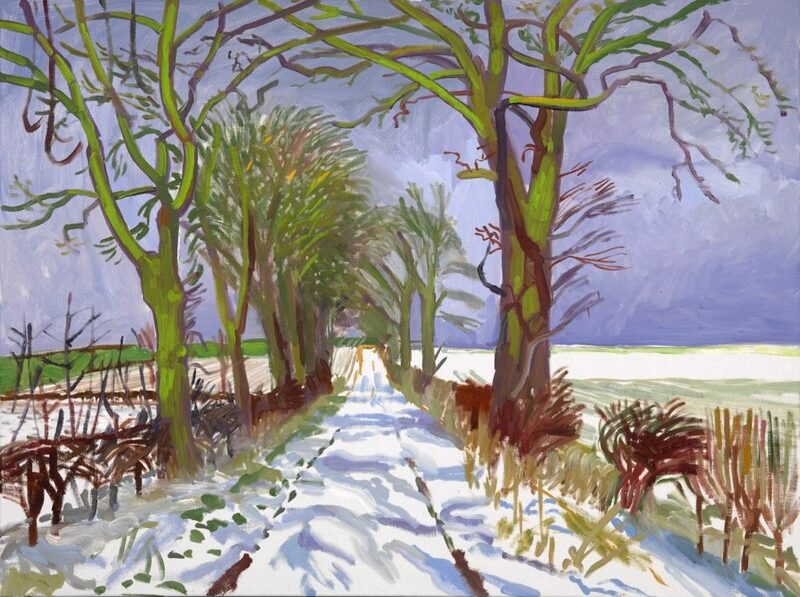 The paintings were based on views of road to the hospital each day, and Hockney became mesmerised by the variety of changing views of the same scene. In 2002 Hockney began to paint the landscape in watercolour, a medium he’d rarely used before, and by 2004 he’d begun concentrating on documenting his local scenery, embarking on a series of paintings within a 30 mile radius of his home in Bridlington. In 2007 Hockney was granted an entire wall in the Royal Academy Summer Exhibition and immediately began working on Bigger Trees near Warter. 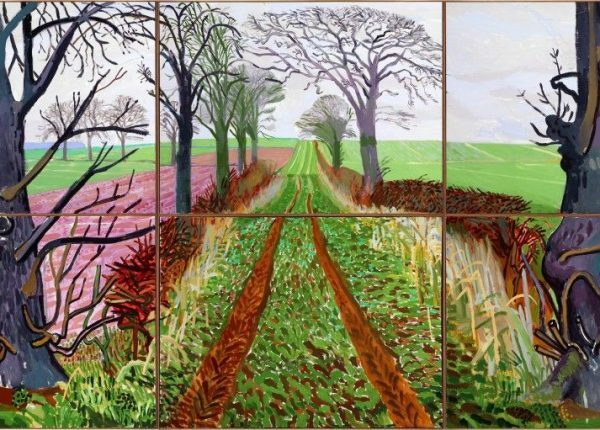 Completed in just a few weeks, the fifty panel painting allowed Hockney to demonstrate everything he’d learnt about his local environment, the weather patterns and the prevailing light. The panels were generally painted in rows, with Hockney compiling a digital montage of the progress each day, allowing him to keep track of the work as a whole. Hockney himself only saw the completed painting days before it was sent to the RA, when he chose a gigantic space in an industrial estate as his new studio. The Royal Academy approached Hockney with a request to show any other works undertaken since his return to Yorkshire, and Hockney agreed. He began compiling sequential views of the landscape, and at the end of 2010 began documenting the arrival of spring in the Woldgate, a small track running between Bridlington and Kilham. 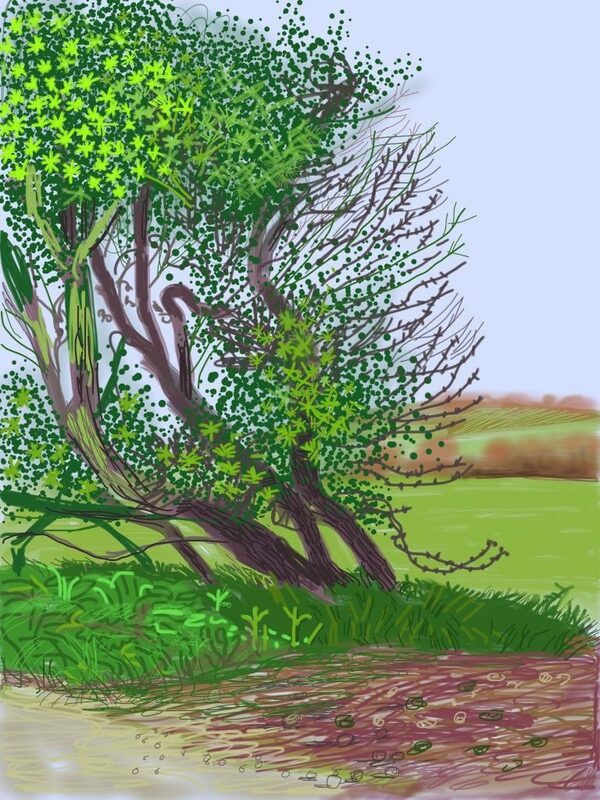 The resulting 51 digital paintings were created on the iPad, allowing Hockney to quickly capture the changes in a variety of scenes every few days for three months. The immediacy of these allows us to see the rapidly changing scenery as spring unfurls. Placed alongside these paintings in Gallery Three is also a thirty-two canvas painting The Arrival of Spring 2011, the culmination of Hockney’s journey into spring. Hockney has said that ‘painting is editing’ – when you paint outside there’s so much to look at that you need to start asking questions: ‘What do I see first? Does the bark of the tree dominate me, does that attract my eye?’ In choosing oil paint over his previous love, photography, Hockney wanted to demonstrate that paintings can be more vivid than photography, and that they can capture the essence of the landscape far better than a camera. To prove his point, Hockney allowed himself to be filmed painting these landscapes on occasion, and having seen these, the vivid almost false colours we see in the results can be seen by the naked eye in the landscape. The distant haze in the sky is indeed lilac, and the trees do morph from black, to green, gold and red. It would be impossible for a photograph to trace this hourly progression in the same way that Hockney’s landscapes do. Also in the show are a number of other works of equally varied landscapes, including his photo montages of the Grand Canyon from the 1980’s, and several re-workings of the Claude’s Sermon on the Mount, with one painting compiled from thirty canvasses, painted in 2010. Whether or not you are a fan of Hockney I would encourage you to go to the final few days of the exhibition. You will learn so much about the art of looking, and about perspective. 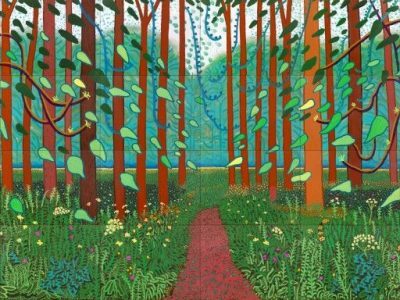 Look beyond the seemingly artificial colours and simplistic shapes and ‘feel’ the landscape Hockney is portraying. This is not meant to be photography, it is representational – you are meant to navigate your own emotional response to the landscape.